Spices are items you need handy for cooking, but tucked away safely when you don’t. They are tiny, but for them to be accessible, we want to organize them so we can find exactly what we want when cooking. 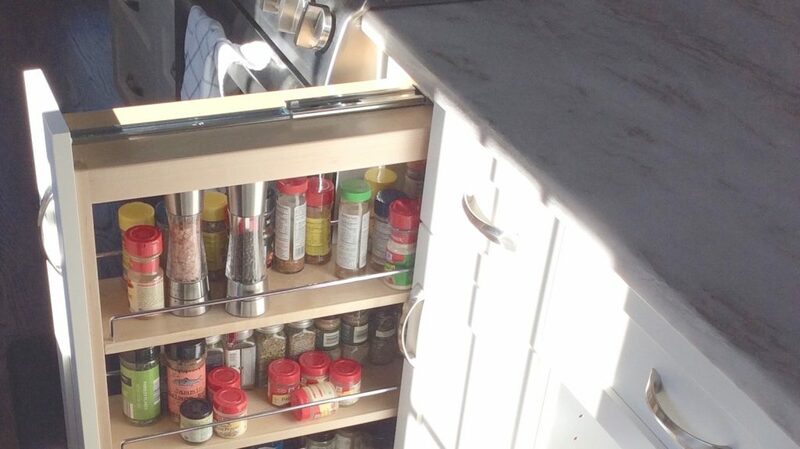 This skinny drawer pull-out holds many different spices, neatly organized by the stove. 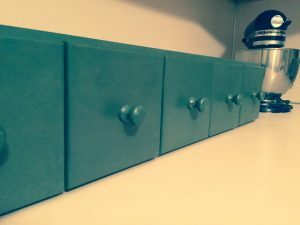 If you love to add a variety of spices to your cooking, you could also use small drawers, sometimes called apothecary drawers. They hold small items nearby but also completely put away. Depending on your use of kitchen tools, you may also find a great benefit to using both shallow drawers and deep drawers for frequently used items. That makes it easier to locate a flat spatula or a deep ladle. Many people store knives in a counter top butcher block. 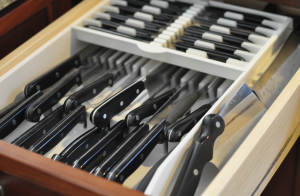 However, knives stored in a separate drawer can be safer if you have kids around. Also, this makes less counter top clutter. A specially designed drawer for knives will keep them sharp and ready, but hidden from view. This protects the knives– and the people who use them. Plus, it’s great to easily see the perfect knife for the job you need. Ready to slice and dice!